Michael Alishaw, 19 years old and studying Maths at Cambridge University. 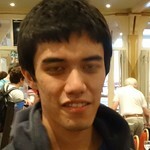 He is from London, and has played in the World Championships, the winning Channel trophy team and won the Peggy Bayer. Away from the bridge table he sleeps an extraordinary amount and is also struggling to combat an addiction to Tea, something that is not helped by spending time with the U25 and girls team.